The truest champions — the ones we remember for years and years and years — are the ones that keep coming even with all those circumstances and setbacks, that won't be kept down because that's what champions do. I wrote those words in February 2010, when our boys were barely a month removed from the 2009 BCS national championship game vs. Texas. At that point, we were riding an undefeated streak that stretched to January of the previous season; were bringing back the reigning Heisman winner; were proudly carrying the belt as reigning national champs; and were tabbed by a number of writers to repeat or at least give it a serious run. And I'm bringing up what happened that fall only because it's received something of a historical re-write, particularly as we're on the verge of defending another championship in the fall of 2012. Coach Saban has discussed the sense of complacency that took over in Tuscaloosa prior to the 2010 season; players and sportswriters alike have written about the disappointment of the season and how we must avoid it this fall.By the sound of it, the team finished something like 8-5, got shelled on the road and generally was a miserable lot that needed to be gutted for the foundation of the program's future. • The 2010 team battled injuries and off-field concerns from before the season started until the last, bitter moments of the Auburn game. Marcell Dareus was suspended at outset for dealings with an agent; Mark Ingram battled knee problems all year; Trent Richardson and Courtney Upshaw battled ankle injuries; Dont'a Hightower was never 100 percent coming back from ACL surgery; Julio Jones played most of the year with a broken hand, and suffered some kind of injury in the second half against Auburn (I don't recall what it was). Actually, Julio and Hanks were both hurt vs. Auburn, along with safety Mark Barron (who was famously unable to raise his arm and turned an easy interception into a game-changing touchdown). 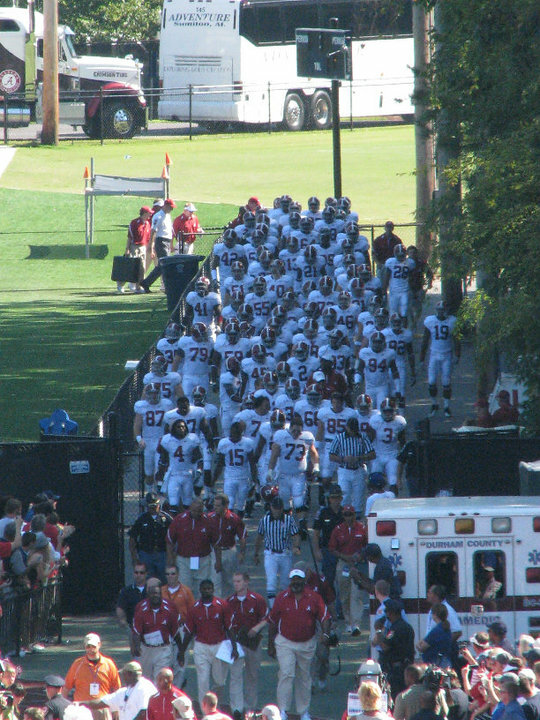 • The 2010 schedule was tougher than it probably appears — based on the final BCS standings from that season, the Tide played the 8th-rated team in the nation, the 10th-rated team and the 19th-rated team (South Carolina, the SEC East champs) on the road; and hosted No. 22 (Mississippi State) ... along with the eventual national champs, with Superman playing quarterback (and this doesn't even count the 9th-ranked Michigan State Alabama throttled in the Capital One Bowl, or the undefeated Florida team we played in September that ultimately crashed and burned after we hammered them at home). That's five teams ranked in the top-25; throwing out the two worthless non-conference games (San Jose State and Georgia State), Alabama's opponents' winning percentage in 2010 was just over 62 percent, slightly better than the 2009 opponents (just under 61). • Look, there's no other way to say it: Alabama was due for a bit of a letdown in 2010. Coming into the season, the Tide had just given its fans 2 seasons of nothing but football bliss; virtually every break we needed in 2008-09, we got, whether it was a fortuitous bounce of the ball or an official's decision or a kicker's failure to elevate the football beyond the giant paws of our nose tackle. Hold on a second: I'd like to enjoy that again. The defending national champs are, of course, the game that will be circled on every calendar for every one of its 13 opponents. Alabama in 2010 absorbed the best shot from every team it played. That's just life in this league. And in reality: here was the difference between the team's final record (10-3) and being undefeated: 14 points at South Carolina (and don't forget, the Tide came back in that game and actually had the ball in position to re-take the lead in the fourth quarter, but squandered it on a fake field goal); 3 points at LSU (how many times are you planning to lose because Jordan Jefferson threw an 80-yard pass? ); and the nauseating famous "Camback" in Tuscaloosa (again, the national champs, with a once-in-a-generation free agent playing QB). It is here that we must stop before we give the 2010 team too much credit. As someone who watches way too much Bama football, when I think of certain teams from certain seasons, each has its own set of characteristics. When I think of 2009, for example, I think of "intensity," as corny as that sounds; that '09 team played with an "eff you" edge to it. The 2011 team I will always think of as "professional" (though not in a way that gets us in trouble); nothing really fazed that team, if anything, it sort of took the joy out of its opponent and never let it breathe (giving rise to the term "Sabanball"). The 2010 team was neither of those. If anything, the 2010 team seemed to play at a high level only in spurts: it played outstanding second halves at Arkansas and at Tennessee; an outstanding first half vs. Florida and Auburn. And other times, it seemed like a disinterested team. There was the bizarre night we went through the motions vs. Ole Miss on Homecoming, or the failure of the team and the coaching staff to prepare for a fake punt vs. LSU. Much of the defensive failure in 2010 — only the fifth-rated team in the nation in total defense, mind you — was laid at the feet of the "young" secondary that did not cover as well as its predecessors. But it's probably just as fair to point the finger at the front-7 — which I did probably too harshly — for its inability to control the line of scrimmage or affect the quarterback in any way. The best secondary in the world can't cover for 10 seconds. As I said at the end of the year, the final effort vs. Michigan State — the only team all season Alabama looked like the team we expected in 2010 — was both dazzling and frustrating at the same time. Where was this team all season? Of course, with a similar story returning to the field for 2012 — an experienced offense next to a talented but young defense — the mantra will be to remember 2010, and hope we can do better. It's a noble goal. But 2010 wasn't all that bad, either.